Most music lovers are familiar with this phenomenon - at night, the whole audio setup sounds much more relaxed and musical. The cause of this lies with two factors. The first is in the human hearing. The central bio processor of our brain is capable of adequately filtering unwanted noises and sounds from the environment. After a while, we are not aware of noises like the constant humming and buzzing of household appliances or highway traffic noise. However, our brains then filter at specific frequency levels. Thus with the unwanted noise, parts of our favorite music are filtered out too. As this filtering involves our brains, we're dealing with an active filter. Active filters consume energy. This makes living and listening to music in a noisy environment very tiring. The second factor that makes late night listening more enjoyable is related to the power grid. At night, less equipment is switched on or active in your home and the surrounding residences, factories and office buildings. Every device drawing current from the power grid adds a little signature to this grid by way of electro-magnetic pollution. It might be a small amount; it might be a large amount. The fact is, at night this pollution is less than during the day. This EM pollution on the grid is audible through our beloved audio systems as noise. With less noise for our brain to filter out, music sounds more like Music. We live in a high rise in the center of downtown Rotterdam. Deep down below the surface, the subway makes its rounds. At street level, trams do the same. Surrounding buildings are home to many companies with their extensive computer parks, copiers and other electrical devices. In our building, two elevators are constantly busy to connect 32 floors. Each floor is home to another lair of electrical equipment. These combined parameters together mean that the nominal European current of 230 volts at 50 Hz from our wall outlets is far from constant. It is not a rare event to see the voltage drop to 210 volts for a short period and then rise to 240. These fluctuations do no harm the connected equipment as most power supplies have been designed for a window of AC instability. Light bulbs however do live dramatically shorter. When listening to music during these fluctuations, dynamic resolution deadens and sharp edges are caused by the far from constant frequency of the AC power. Take a look at the sine wave from the wall. Instead of a nicely regulated 50 or 60Hz sinewave, it is literally bent out of shape. Like most music lovers, we've installed so-called power conditioners. These filters help to protect against surges that might be powerful enough to damage connected equipment. They also filter out some of the noise riding on the AC current. The overall result is a quieter listening experience - sometimes perhaps too quiet even. There are many power amplifiers that don't do well with a filter between them and the wall outlet. They want to go unprotected to fully bloom. Any filtering makes them sound constricted. The only other thing you can do is use a clean earth ground and a dedicated line. Until the PS Audio Power Plant P1000 landed on our 32nd floor, that is. At 100 lbs and measuring 17" x 9" x 20", it arrives in a big box. That box not only contains the power plant but also a pair of workman's gloves. Gloves? Yes, the curved sides of the P1000 are the cooling fins and they have razor-sharp corners. They look great but it is a miracle how the Denver/CO company gets away with this in a country as over-regulated as the US, let alone the EU. Our advice for the time being is to keep anything that crawls or walks barefoot out of harm's way. The front of the P1000 is designed like all PS Audio amplifiers and power plants - nice solid aluminum in curvaceous shapes. In the middle of the front, a large display hovers over five switches. The power on/off switch sits in the middle of four selector switches. The top plate is a heavy black slab of aluminum attached to the frame with a number of 7/64" bolts. Though the front looks nice and unobtrusive, the back is the most interesting part. Here we find 10 heavy-duty outlets Euro-style. The leftmost two are filtered outlets only - Ultimate Outlets in PS Audio speak. The other eight supply regenerated power. Two easy-access fuses and the IEC power inlet complete the back. Our curiosity to what lives inside the big P1000 had to wait a little. A 7/64" nut driver is not a common find in a European toolbox. When a matching wrench was located and the lid finally removed, two huge toroidal transformers stared us in the face. These two fill nearly three quarters of the interior space, being immense not only in diameter but also height. The rest of the space is occupied by neatly arranged electronics. The lid goes back on and 100 lbs of power plant are hauled into place. The P1000 arrived with a PS Audio power cable and that connects the device to the wall outlet of the dedicated audio line. The 8 regenerated power outlets are ample for our equipment needs. CD transport, preamplifier, DAC, amplifier and both Avantgarde Acoustic Duo subwoofers plug in with Crystal Cable Power Reference. The Acoustic Signature Mambo turntable in for a review has a separate motor controller that connects to one of the filtered outlets. After first switching on the P1000 on and then the rest of the equipment, we spend some time reading the manual as the tubes settle in. The P1000 takes 230V/50Hz AC from the wall outlet and converts this to DC before reconverting to AC. That AC now can be of any value between 220 - 250 volts, at any frequency between 50 and 120Hz. The output voltage can be selected in 2-volt steps while the frequency can be adjusted in 1-Hz increments. Best of all, the P1000 delivers balanced power. Instead of having one 'hot' pin deliver the positive 220 to 250 volts and the other pin being the zero return, the P1000 delivers 110 to 125 volts on each pin but out of phase with each other. Balanced power is the next hot thing in audio land. 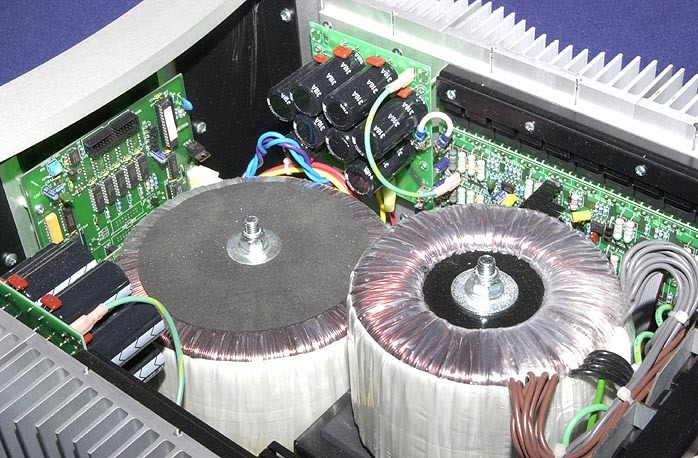 Not only are more and more makers of audio equipment attempting to build a balanced power supply into their amplifiers, more and more audiophiles are rewiring their power lines with a transformer-coupled balanced AC mains supply. A good example to grasp how balanced power works is the following. Remove two batteries from your Mag-Lite. Each battery is 1.5 volts. Now line them up such that the + terminal of the left battery connects to the - terminal of the right battery. The two batteries are now connected in series. When you measure the voltage between both extremes, you see 3 volts. Now take a length of wire and connect one end to ground and the other at the connection point of the batteries. Measure between the ground point and the negative terminal of the leftmost battery. You'll see -1.5 volts. When measuring at the + side of the right battery, you'll see + 1.5 volts. Voilà, a balanced power supply. Not only are line voltage and frequency adjustable via the P1000, the build-in DSP logic is capable of more. Besides regenerating a perfect 50 to 120Hz sine wave, Paul McGowan and his team added a so-called MultiWave generator. Using the switches on the front, the P1000 can be set to Twave, Mwave1, Mwave2, Mwav3, Mwav4 and Auto. All these are MultiWave patterns. Twave stands for TubeWave. With this setting, the P1000 will inject a 60 Hz sine wave with random frequencies between 55 to 65Hz. The randomization is not that random since the chosen injection frequencies are meant to enhance the sound of all tube gear. In a solid-state environment, the resultant sound will be more rounded and warm - more tube like. Injection takes place at the point where the sine wave crosses the 0 line. Then there are the Mwave1 through 4 settings. Mwave1 adds some 3rd order harmonics to a 60Hz sine wave. The effect is a square wave with rounded edges. This waveform is designed to enhance the loading of capacitors in the power supplies of connected equipment. For this specific purpose of capacitor charging, the peaks of a sinewave are important. By squaring off a typical sinewave, capacitor recharge times are accelerated to help increase the dynamic characteristics of an amplifier. MWave2 is a bit like TubeWave by injecting 55 - 65Hz frequencies into the standard sine wave though here the added frequency pattern is not focused on tubes. MultiWave2 aims at stabilizing and quieting the sound by eliminating harsh edges and blackening the background. Mwave 3 is a combination of the added 3rd order harmonics of Mwave1 and the Mwave2 pattern and aimed at combination use with video equipment. Mwave4 adds further 3rd order harmonics over Mwave3. The final setting in the P1000 palette is called AutoWave. With this setting, the random regenerator senses the load connected to it and on that basis selects the most appropriate MultiWave setting. As a bonus, the P1000 can also degauss the entire system connected to it. By sending a special frequency pattern through the cables, all components that can get magnetized are de-magnetized. It works a little bit like a Denson De-Magic CD but from the power supply side.